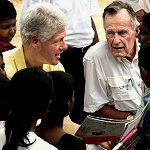 Former U.S. Presidents Bill Clinton and George Bush, Sr., visited Sri Lanka as they continued their four-country tour to the tsunami region. Clinton and Bush both indicated that seeing the devastation firsthand deeply affected them. “I think its almost impossible to appreciate the scope of this [disaster] if you haven't physically seen [it]," said Clinton. "You know we watch it carefully on television, it's not the same." Clinton and Bush met several children who survived the disaster. Many of the children sang and danced for the former presidents, and others presented them with crayon pictures depicting their experiences with the disaster. “They were delighted to meet the children,” said Philip Frayne, spokesman for the U.S. embassy in Sri Lanka. But Clinton and Bush expressed great concern for the children, realizing that they wil need long-term psychological help. “[Clinton and Bush] said that one of the things that people sometimes forget is that there's not just a need for reconstruction of houses and fishing boats and things, but there is also a need for counseling of the victims and above all for counseling of children that may have lost brothers and sisters and parents in the tsunami," said Frayne.